1. What are the benefits to me of building a sustainable home? 2. ​That’s all well and good but what sort of savings can I expect? 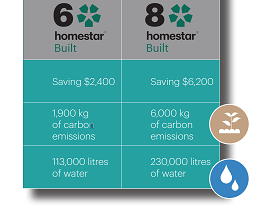 ​Have a look at the image below to see the energy, water and carbon emissions savings expected in just one year in a Homestar® certified home. Homes are rated on a scale of 6 to 10. Several categories are assessed during Homestar® certification including energy, health and comfort, water waste and materials. Both the design of the home and the construction process are assessed. At Craft Homes we are Homestar® Practitioners and Assessors meaning we can take full responsibility for building you a certified sustainable home without the middleman. For more info see “Homestar® Approved” on our website. 4. ​How much more will it cost to build a sustainable home? It’s not necessarily the more you spend the more energy efficient your home will be, it’s about the smartest use of design and materials. With good planning and the right advice from certified professionals you can build a home that meets your desired budget and scope of work. Therefore, it is up to you what level of investment you would like to make. 5. ​How does this work with renovations? Think about building sustainably as a scale; at one end of the scale are Homestar® 10 built homes where every design and build element meets with a very high sustainability benchmark. Compare this to choosing to make a few changes to your renovation project that improves the energy efficiency of the build process and finished home, such as choosing higher spec insulation, high water and energy rated appliances or opting for recycled products like reclaimed stone. Talk to your architect and builder early on in regards to the type of choices you can make to build a more sustainable home. 6. ​At what stage do I involve a builder? ​This is completely up to you. Some people like to get their plans well under way with their chosen architect before getting a builder on board. We recommend talking to a builder in the early design stages. Bringing in a builders experience and expertise, particularly in pricing, means that you can work together to ensure that your scope of work will match the budget that you have. 7. ​Will I need building consent? ​Most building work will need consent. Talking to your architect or builder early on regarding the consent process and time frame will help you plan for your build. 8. ​Do I need a Licensed Building Practitioner (LBP)? As per the regulation set out by the NZ Building Act (2012), any work that is critical to the integrity of the building must be done by an LBP. This includes things like structural work, weather tightness and fire safety systems. Having an LBP on site means that you have the assurance that their workmanship is covered by their own license and also that they are liable for any mistakes. 9. ​Should my builder be a member of an association? To give you independent assurance that your home will be completed to a high standard it is highly recommended that you choose a builder certified with an organization such as the NZ Certified Builders. This ensures they are trade qualified, have suitable references as well as ongoing industry training. 10. ​HOW CAN I KEEP MY BUILD ON BUDGET? ​At Craft Homes we have a transparent and systematic approach to all of our builds. Our director Toby, will work with you from the early design stages right through to project completion to ensure we are always on the same page. We provide you with 24/7 access to the latest project management software meaning you can track your budget and timeline at every stage. Any changes or variations to the build have to be confirmed with you prior to the work being undertaken. 11. ​ WHAT DOES “FIXED PRICE” AND “COST PLUS MARGIN” PRICING MEAN? ​We provide all of our customers with an NZ Certified Builders contract with the choice of a fixed price or cost plus margin pricing structure. A Fixed price means that we give you a fixed sum of what the build will cost. You will then make progress payments at pre-defined stages throughout your build. With Cost plus Margin we give you an estimated sum of what the build will cost. You will then be charged weekly for labour, materials and sub-contractors with an agreed margin added. With either pricing structure, any variations to the plan will be charged as additional expenses but must be agreed by you first. ​This is completely up to you. Some of our customers prefer a Fixed price as it gives them more certainty at the start of the build and it helps them plan their payments better. On the other hand some people prefer Cost plus Margin as it gives them greater transparency with all of the individual costs. Talk to one of the Craft Homes team about what is better for you.